LOOKING BACK: An artist's view from New Horizon's looking back toward Pluto, Charon and the Sun. WASHINGTON -- NASA officials are worried that a work stoppage at Los Alamos National Laboratory could delay the launch of a nuclear-powered Pluto mission by a year and postpone the spacecraft's arrival at its destination by two and a half years. The U.S. Department of Energy's Los Alamos lab halted all classified work July 15 after two computer disks containing classified information were discovered missing. The following day the director of the lab expanded the shutdown to nearly all activities. Some routine administrative work had resumed at the lab by July 29, but a NASA official said it remains unclear how soon lab employees would get back to doing the kind of sensitive work the space agency is counting on for its Pluto mission. Orlando Figueroa, director of NASA's solar system exploration division, told Space News on Monday that the latest Los Alamos shutdown is making it increasingly likely that the New Horizon Pluto probe will not be able to make a two- to three-week launch window set for January 2006. Figueroa said Los Alamos was already scrambling to make up schedule lost during previous security-related stand down. "Getting past the first shutdown took a tremendous effort," Figueroa said. "The latest shutdown took the threat from Code Orange to Code Red real quick." NASA is counting on Los Alamos to transform by December raw plutonium-238 bought from Russia into tiny pellets that power long-lasting spacecraft batteries known as radioisotope thermal generators (RTGs). The plutonium must then be certified and delivered to Argonne National Laboratory's nuclear facility outside Idaho Falls, Idaho by February if NASA and the Department of Energy hope to keep the project on schedule. Los Alamos officials have not said when nuclear work will resume at the lab. Figueroa said he has been in contact with his Department of Energy contacts frequently since the shutdown was announced. He said he hopes to have a better idea by mid-August of when the NASA related work would be permitted to resume and whether the Department of Energy will be able to make up the lost time. Figueroa said the lab shutdown is not the only thing putting the January 2006 launch window in jeopardy. NASA's officials at Kennedy Space Center in Florida are also facing a very tight schedule for flight qualifying solid rocket boosters the Altas 5 rocket needs to boost the Pluto spacecraft. The spacecraft itself, still in development, is also encountering the usual hiccups, Figueroa said. "From the get go we knew that making 2006 was going to be very tight," he said. "Across the board we knew this was going to be a heck of a challenge and has proven to be so every step of the way." 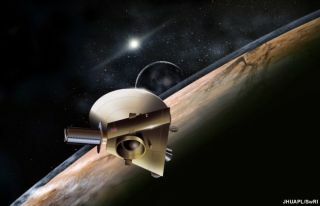 Even if NASA and its teammates manage to launch the New Horizons probe in January 2006, it will still be 2015 before the spacecraft reaches Pluto. Figueroa said slipping the launch until January 2007 -- the next available window -- would add two and a half years to the travel time and millions of dollars to the cost of the mission.